Owning a large garden with a wide expanse of lawn can be a joy, if you have one of the best gas lawn mowers to trim it without too much effort! Gas lawn-mowers are the only mowers that can cope with uneven ground, and have enough power to cover large areas quickly. The latest gas mowers minimize all of that back and shoulder strain, with the latest self-propulsion technology. Self-propulsion systems use the engine to turn the wheels, so you just need to push lightly and steer! The most common problems for gas lawn-mowers are related to the carburetor, but you can avoid them if you use non-ethanol fuels and follow the maintenance instructions in the manual. This includes simple tasks like oil-changes and using the correct fuel-mix. In addition, there’s also a list of parts to be cleaned, and replaced after a certain number of hours’ use. And to save you even more time, here’s what to look out for in the latest gas lawn mowers. Wider cutting-blades mean fewer passes over the lawn, making the work faster and easier. Larger waste-bags mean fewer emptying times, but as the bag fills up it will be heavier to push. All gas-powered engines make a loud noise, so if that’s a possible problem, you’ll find the smaller models are usually less noisy. Being able to adjust the cutting-height easily is essential for several reasons. Different types of grass need cutting to different heights for best appearance and any over-grown areas of grass need a higher cutting-blade for easier cutting. The best lawn-mowers have adjustable levers on each wheel for convenient changes of blade height. So let’s get started on our short-cut guide to the best gas lawn-mowers! The all-round best gas lawn-mower is the Honda HRX 217K, which has every helpful feature you can imagine. Although this is the heaviest model in our reviews, ‘self-propulsion’ technology turns the wheels, so the machine is easy to push around your lawn. And this model has the largest clippings-bag at 3.1 cu. ft. reducing the times you need to stop and empty it out. 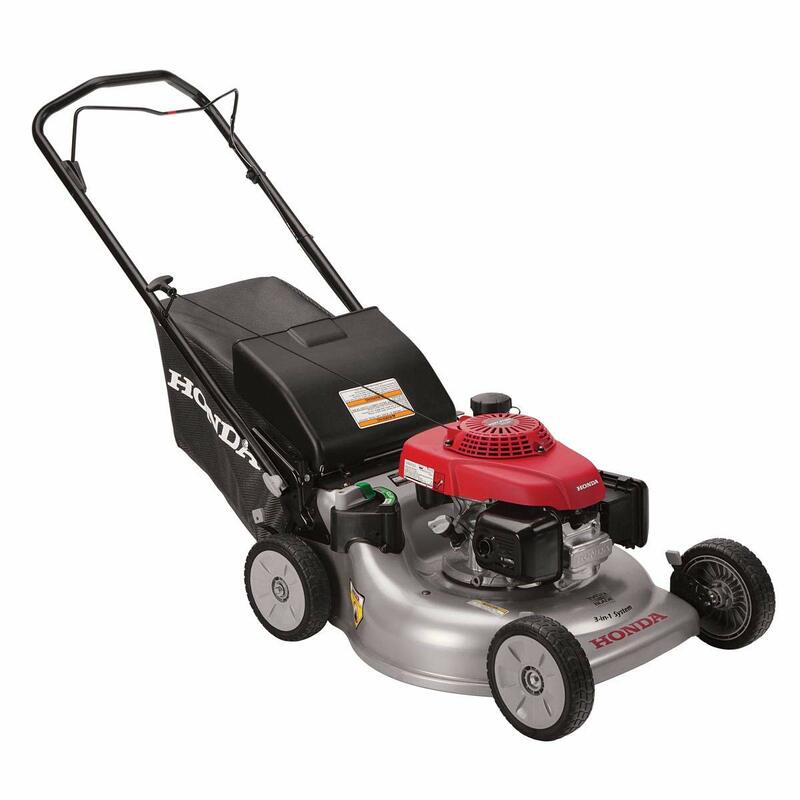 Most gas-mowers have just two cutting surfaces. However, the Honda HRX 217K delivers a very even, overall cut from 4 cutting-edges provided by the special Micro-Cut blades. This design feature reduces ‘clumping’ and leaves a lovely, fine cut. And this unit has 7 different cutting heights, measuring from ¾” to 4”, which is the widest range of cutting heights for gas lawn mowers. It’s a great gas lawn-mower for large areas over about one-third of an acre. We chose the Lawn-Boy 17734 as the best quick-start gas lawn-mower, as it has a unique electric-start feature. You actually have a choice between pull-cord and electric-start, which is a distinct advantage over most gas mowers. 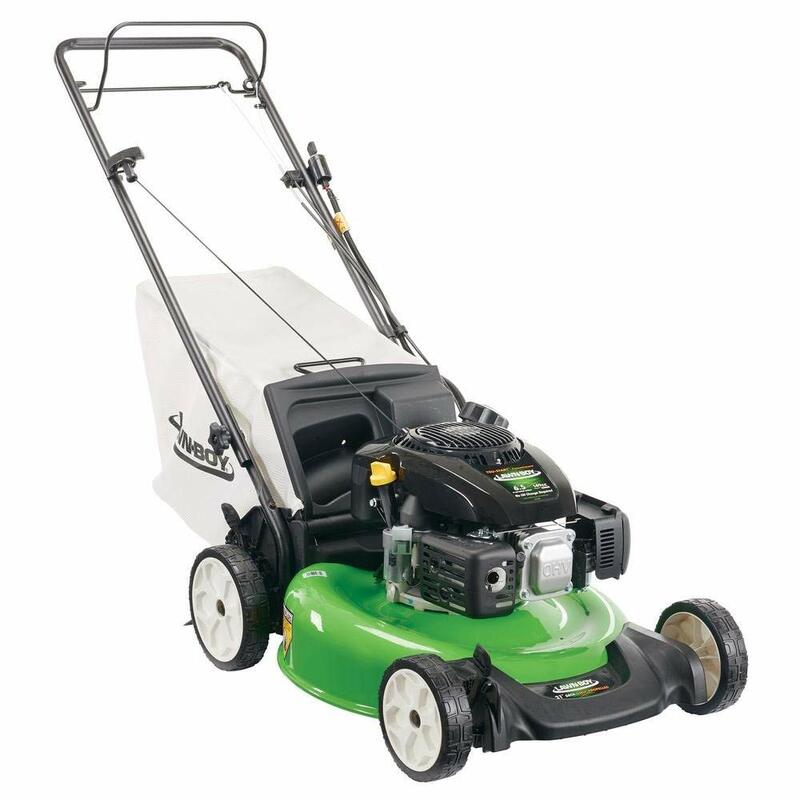 With a 21” cutting-width, this is a great choice for small to medium lawns. And the 149 cc engine is quieter than most gas lawn mowers. The Lawn-Boy is lightweight and with large, 11” wheels at the front and back, you get excellent stability on uneven ground. This mower also has a very large cuttings-bag, measuring 3 cu. ft., which needs fewer emptying breaks. It’s a super lawn-mower that anyone can handle, in a pleasant green color instead of the usual garish red, black and orange! The best gas lawn-mower for tough lawns is the Poulan Pro 675, which with nine different cutting-heights beats all other mowers for cutting height range. The high-cut setting is easy to adjust from one lever, so you can efficiently mow down patches of tough weeds and grass. You get a good, uniform cut with one-lever height adjustment and the side-discharge is less likely to become clogged. The four-wheel drive, with variable speeds, tackles rough or uneven ground easily. And the 22” cutting-width is wider than average, too. The only downside is that the clippings-bag is smaller than some others in our 5 top gas mowers, so it would need more frequent emptying on larger lawns. 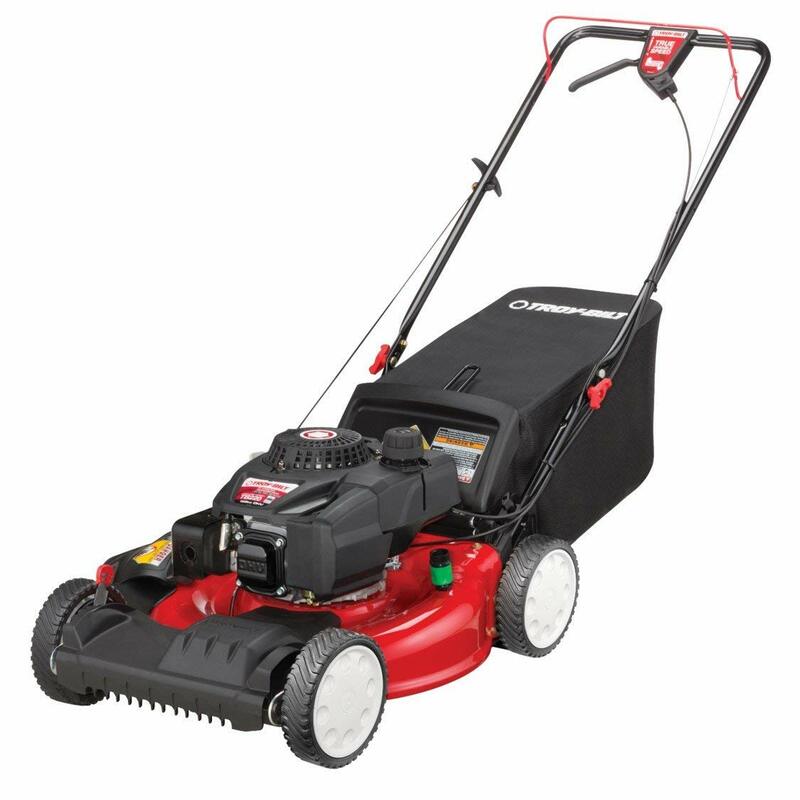 We chose the Troy-Bilt as the ‘best value for money’ model in our best gas lawn mowers list. We rate it as a good, solid machine with a front-wheel self-propulsion system, so anyone can push it across grass. 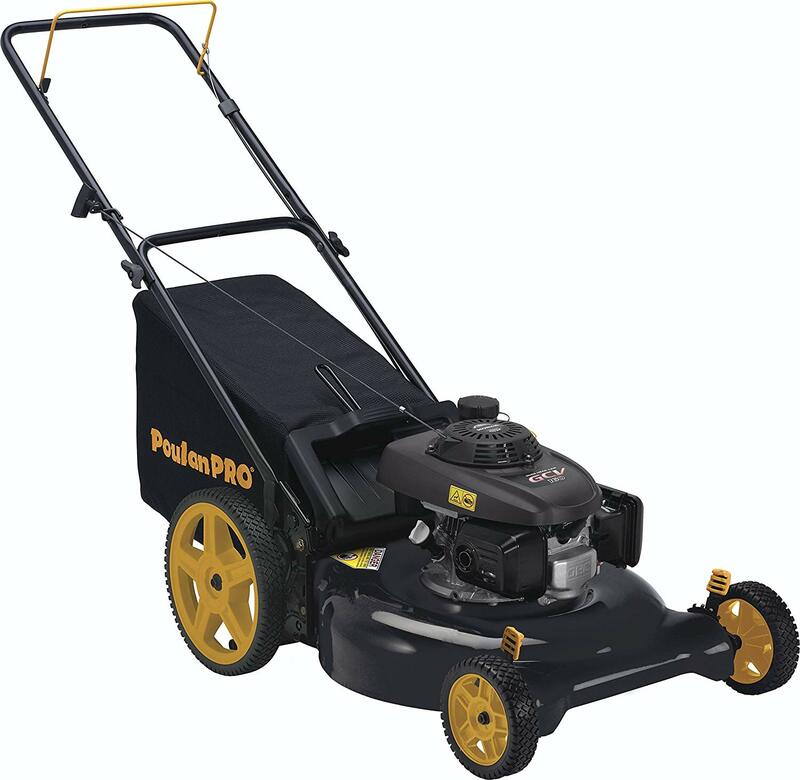 It has a wide, 21” cutting-path like the most expensive models and costs significantly less than the other gas-mowers in our review. The only disadvantages are that unlike all of the other models in our review, the Troy-Bilt does not have an ergonomic, cushioned push-handle. The gas lawn-mowers reviewed above all have a rubber or foam cushioned handle. And that means you can use the handle without gloves and not get blisters. But if your budget is tight, you may choose the buy the Troy-Bilt and wear gardening gloves when you use it to avoid hand-chafing. And at 2.4 cu. ft. the clip-bag is smaller than the bags on other mowers. So although this isn’t a problem on small to medium lawns, you would need to stop more often to empty the bag when trimming a larger lawn. Lightweight and easy to handle at 85 lbs. Smaller bag at 2.4 cu. ft.
And for easy handling by smaller individuals, we chose the Honda HRR. Although it doesn’t have an electric-starter, this model has a great reputation for starting first-time. You can switch easily between ‘bag’ and ‘mulch’ features. 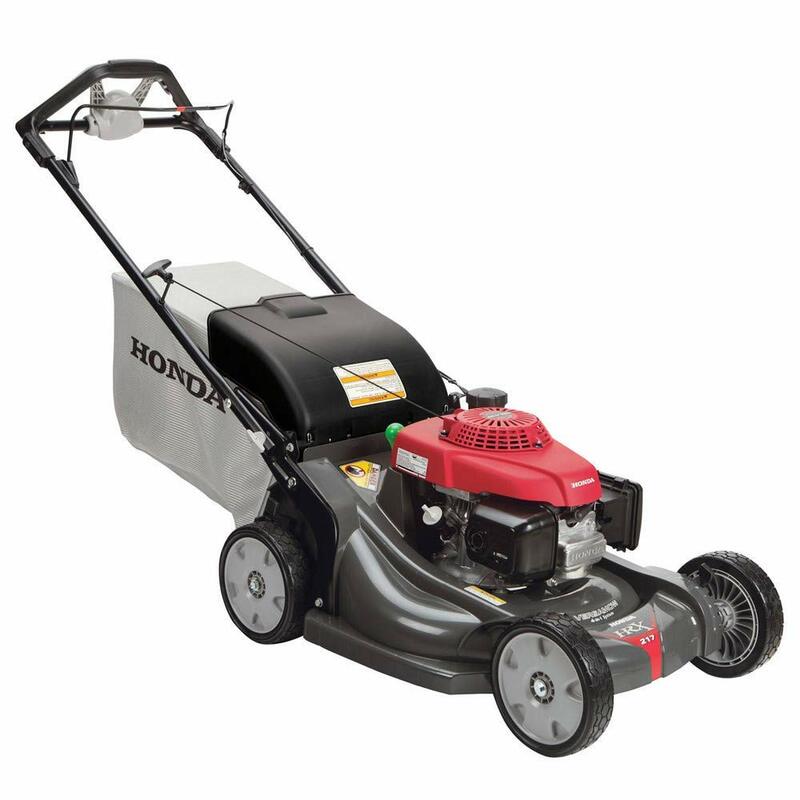 And the Honda HRR offers uniform, ultra-fine cutting from special Micro-Cut double-blades. This makes tiny clippings that are easier to mulch-down for re-use around your garden. The 160 cc, single-cylinder, 4-stroke engine can handle tough grass with no problem and takes straight gas. So you don’t need to puzzle over getting the correct gas/oil mix. The 0 – 4 m.p.h. is variable between slow, medium and fast. And this allows you to slow down around obstacles or speed up on flat ground. You need to adjust the 6 different cutting-heights separately on each wheel, but that’s not a big deal. Low 41” handle height and light weight mean it’s good for smaller, lighter individuals to handle easily. The only real drawback is the noise it makes, which at 98.5 decibels could be annoying for near neighbors. Lightest unit at 84 lbs. Each of these gas lawn mowers was tested on a fairly flat, 1/4 acre lawn with a popular type of lawn-grass. The grass had been allowed to grow for a one- to two-week period and there was no added gravel, or garden debris, on the ground. With this overview of the various differences between the best-performing gas lawn-mowers, you should have a clear idea of what you need for your garden. Price-wise, electric lawn mowers and gas lawn-mowers are pretty much on a par, but the advantage of buying a gas mower is the sheer extra power these machines offer. And for ease-of-use on tough, uneven ground or larger grassed areas, we believe that the gas lawn-mower’s definitely ‘top dog’!